make sure you are using enough leader ( you say you are being left with a few inches of leader so it doesnt sound like youre Knot ) i tend to use twice the length of the rod and atleast half a dozen turns on the reel. Is it possible that your shock leader line is old or a faulty batch? 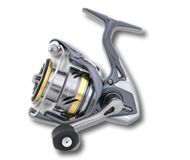 Did the Abu rod and fixed spool reel that you also tried have a shock leader from the same batch? The only other thing that I can think of is that, as Jim79 suggests, you could need more length of shock leader line. Also, re-check your rod rings to make sure that they are not damaging the line. Or perhaps you should just cut down on the spinach LOL !!! There is some rubbishy shockleader line about at present. I actually got conned into buying some earlier this year (sounded a bit cheap to me but the tackle shop didn't have my usual stuff.) Anyway, once I realised that I had been sold a pup, I went back to my usual which is of course - Greased Weasel. 2. Not enough of the thick stuff wound on to reel - which would explain a few inches still attached. sounds like a dodgy spool of shockleader. what are you using at the moment? greased weasel probably isnt the cheapest but its not exactly expensive either and you wont hear of too many complaints from people that use it.